Are you looking for something quick to whip up for the Australia Day long weekend? 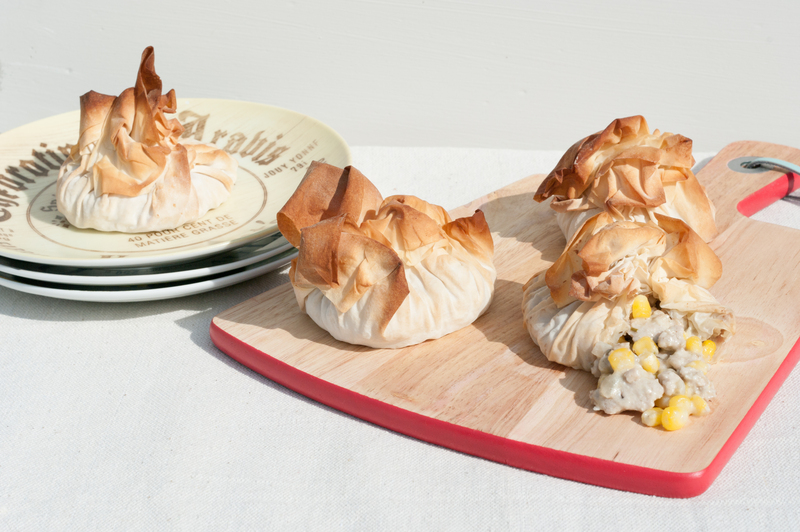 These Chicken and Corn Filo Parcels are the perfect go-to for a bring a plate or backyard feast. The filling can be made the night before and simply popped in the fridge until needed. Heat oil in a large, deep frying pan over medium heat. Add onion and garlic. Cook, stirring occasionally, for 3 to 4 minutes or until soft. Add chicken mince and herbs. Cook, stirring often, for 5 minutes or until browned. Add corn, cream, water and flour. Cook, stirring often, for 5 minutes or until sauce has thickened. Transfer chicken and corn mixture to a large heatproof bowl and cool. Place 1 sheet of filo on a flat surface and brush with butter. Fold into thirds to make a rectangle and place ½ cup of chicken and corn mixture into the centre. Pull all covers into the middle so that they meet and pinch to secure. Brush with melted butter. Repeat with remaining mixture. Bake for 15-20 minutes or until golden and heated through. Stand for 2 minutes. Serve with salad. What a grat combination of cripsy filo and delicate chicken and corn! Thank you! It was a delicious combo and the sauciness of the mixture made it almost self-saucing. Delicious.